This side dish is spicy and sweet with no added sugars! You may not think to use your slow cooker in the summer months, but I recommend pairing this with barbecued pork. This dish is medium heat, so you can adjust the heat by adjusting the amount of cayenne pepper. 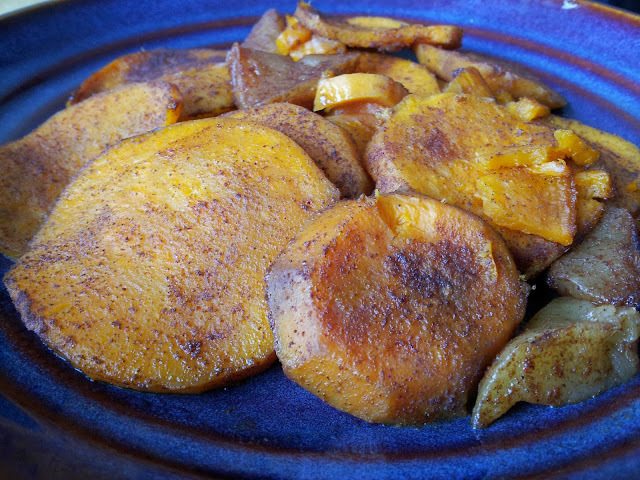 Slice sweet potatoes into medallions (about 1/2cm thick) and place a layer on the bottom of the slow cooker pot. Chop apple into chunks and layer on top of sweet potatoes. Mix cinnamon, cayenne, cumin and salt together and evenly pour over potatoes and apples, then toss to coat evenly. Drizzle coconut oil over top, and place lid on slow cooker. Cook on high for 2.5 hours.